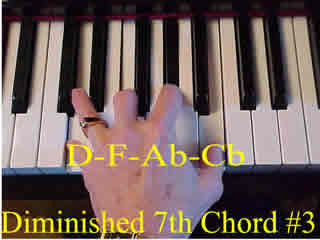 Diminished 7th chords are unique animals. They have some unusual qualities that make them interesting and useable. For example, they are the only type of chord that is simply a stack of minor 3rds. If you count from one chord note to the next, you will find that they are all equidistant. 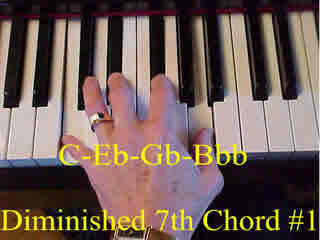 A diminished chord occurs most frequently in jazz and popular music as a four-note chord, as shown above, regardless of whether the symbol says Co or C07. 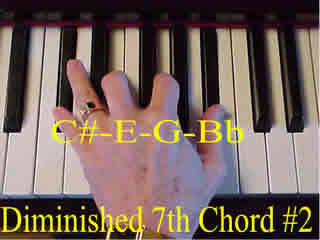 The 7th of the chord is a diminished 7th, but is sometimes spelled as a major 6th. When we get into chord progressions, we will see that diminished 7th chords can be used as "modulation agents," "transposition agents," and "transition agents." So learn them well in ALL inversions.